Mantle plumes are hot buoyant upwellings that rise from Earth’s core–mantle-boundary to its surface where they can produce large igneous provinces (LIPs) such as the 252 Ma Siberian Traps and volcanic tracks such as Hawaii-Emperor chain. We do a numerical analysis to characterize how flattened mantle plume heads (marking the arrival of a mantle plume to the base of the lithosphere and having a radii of >1200 km in the uppermost mantle) can heat the overlying lithospheric mantle to temperatures above the diamond stability field. As a consequence, mantle plumes can destroy diamonds within the roots of Archean cratons, the principal source of diamonds in kimberlites. We quantitatively demonstrate that there is a ‘sour spot’ for this effect that occurs when lithosphere is 165–185 km thick and the plume has a temperature of >150oC above background mantle. Fig. 1. A regime diagram illustrating the reduction in thickness of the diamond stability field (ΔZG:D) as a function of a plume head’s excess temperature, ΔTP, and the thickness of the overlying lithospheric lid. Pairs of numbers in each bin reflect thickness of lithosphere (in km) within the diamond window prior to plume arrival and the thickness of the diamond window remaining following the plume thermal pulse. Regions A–D are discussed below. No diamond window either before or after plume head arrival: lithosphere with a thickness of ca. 150 km or less is too thin to support diamond formation, either before or after plume head arrival. Total loss of diamond window: within this part of the regime diagram some diamond stability is present prior to the arrival of a plume head, but its arrival destroys the entire diamond window of the lithosphere. Significant loss of diamond window: only part of the lithosphere is heated above diamond-stable conditions and, hence, only partial loss occurs in the thickness of the lithospheric diamond window. However, this regime includes the largest thicknesses of both original diamond stability and subsequent loss due to heating by the plume and, hence, it is this regime that displays the most dramatic post-plume diamond destruction effect. Note that following the thermal pulse, the residual diamond window is retained at the base of the lithosphere but not at higher levels. Minor or no loss of diamond window: the thickest lithosphere examined is 200 km. 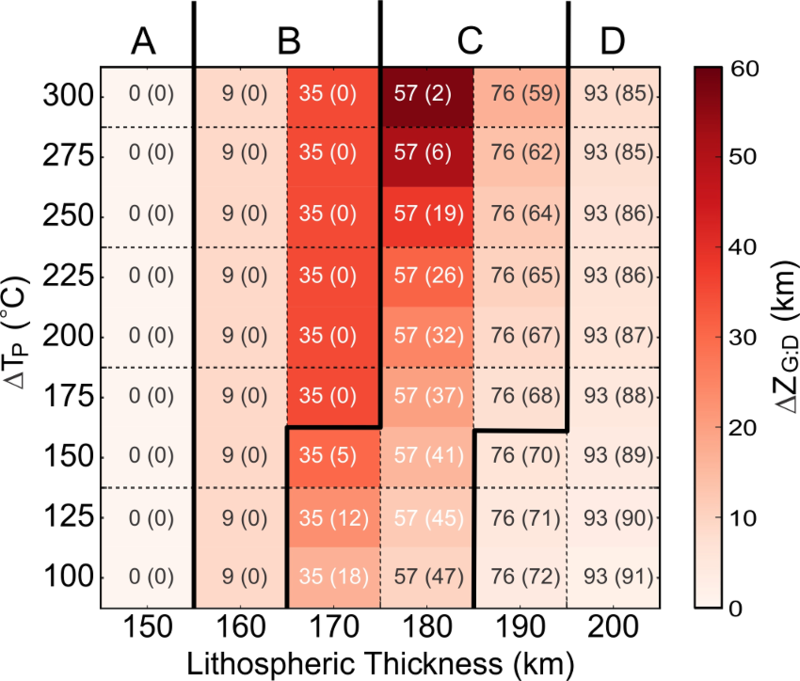 Under the range of excess temperatures considered, the depth over which the diamond window is lost is small (<8 km lost of 93 km of diamond potential). For the purposes of this diagram we define this category as where the loss is ≤10% of the original diamond window thickness (90% of diamond window retained). Fig. 2. Schematic illustration of the timing of loss and regaining of diamond window in the two examples displayed in Figures 3 and 4. Numbers denote age (Ma). Fig. 3. 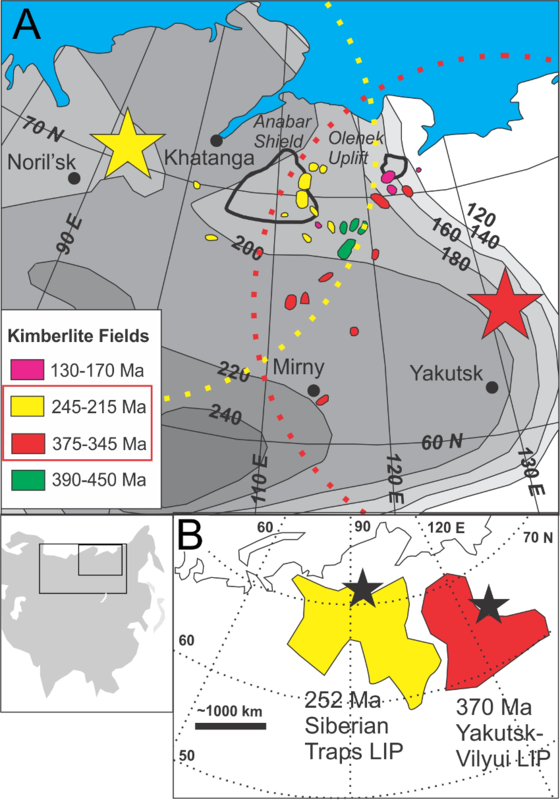 Kimberlite fields of northern Siberia and their associated with plume/LIP events. A). Distribution and ages of kimberlite fields from Sun et al. (2014). Plume centers and 1200 km radius circles after Fig.7B in Ernst and Jowitt (2013). Superimposed contours of lithospheric thickness are after McKenzie and Priestley (2008). Red box in legend identifies the two ages of kimberlites that are focus of this study. Symbol colours matched to event. B) regional distribution of 252 Ma Siberian Traps and 370 Ma Yakutsk Vilyui LIPs and their associated plume centers, marked by stars (e.g. Ernst, 2014). Our model can explain why the kimberlites associated with the 370 Ma Yakutsk–Vilyui plume in the Siberian craton are diamondiferous whilst those associated with the younger 250 Ma Siberian Traps plume are barren (Fig. 2, 3). Fig. 4. 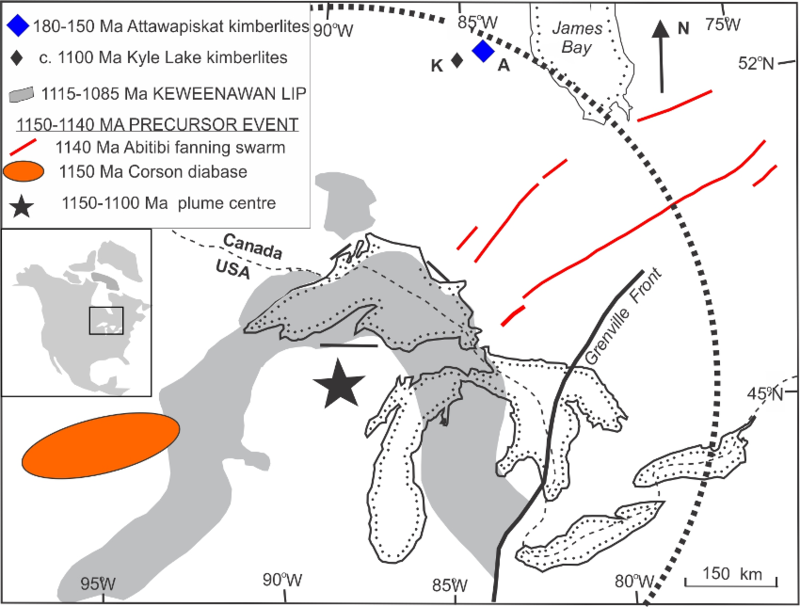 Distribution of Kyle Lake and Attawapiskat kimberlite fields with respect to the Keweenawan LIP. Modified after Fig. 9.9 in Ernst (2014) and Fig. 1 in McCormick et al. (2018). Some additional units mentioned in McCormick et al. (2018) may also belong to the Precursor event. Dotted line marks a radius of 1000 km about the plume center. We also show that the time required to restore the pre-plume thermal structure of the lithosphere is ca. 75–120 Myr, and that destroyed diamonds may regrow once the plume’s thermal effect dissipates. The 1100 Ma Kyle Lake and adjacent 180–150 Ma Attawapiskat kimberlites in the southern Superior craton exemplify this, where the older kimberlites are associated with a narrower diamond window (<30 km) in comparison with the ca. 85 km diamond window of the younger Attawapiskat field (Figs. 2, 4). Ernst, R.E. (2014). Large Igneous Provinces. Cambridge University Press. 653 p.
Ernst, R.E., Jowitt, S.M. (2013). Large Igneous Provinces (LIPs) and metallogeny. In: Colpron, M., Bissig, T., Rusk, B.G., Thompson, J.F.H. (Eds. ), Tectonics, Metallogeny, and Discovery: The North American Cordillera and Similar Accretionary Settings. In: Society Economic Geologists Special Publication, v.17, p.17–51. McCormick, K.A., Chamberlain, K.R., Paterson, C.J. (2018). U–Pb baddeleyite crystallization age for a Corson diabase intrusion: possible Midcontinent Rift magmatism in eastern South Dakota. Canadian Journal of Earth Sciences, v. 55, p.: 111-117. McKenzie, D., Priestley, K. (2008). The influence of lithospheric thickness variations on continental evolution. Lithos, v. 102, p. 1–11. Sun, J., Liu, C-Z., Tappe, S., Kostrovitsky, S.I., Wu, F-Y., Yakovlev, D., Yang, Y-H., Yang, J-H. (2014). Repeated kimberlite magmatism beneath Yakutia and its relationship to Siberian flood volcanism: insights from in situ U–Pb and Sr–Nd perovskite isotope analysis. Earth and Planetary Science Letters, v. 404, p. 283–295.